The G30 driver from PING Golf got a great introduction last year when it was used by fan-favorite Bubba Watson and received a lot of air time plus of course his G30 has a vivid pink shaft which attracted fans and was easily distinguishable. In case you want to know, Watson uses the 9-degree model opened to 8.25 degrees and the shaft is a 44 ½ inch Grafalloy Bi-Matrix Rocket Pink X-Flex (1/2 inch tipped) swinging to D4. However since he swings at 120 mph and regularly hits the ball 350 yards those specification don’t have much relevance to the average golfer (and even most tour pros). What I was interested in was the results an average player could get so the G30 went in my bag for an extended trial in actual course conditions, i.e. wind, rain, hard and soft fairways not to mention the inconsistencies of my swing on any given day. Striations on the crown called “turbulators” added 2 mph to Watson’s clubhead speed and presumably add speed to an average player’s swing as well. The biggest plus for the G30 though is the confidence inspiring sound and feel at impact, characteristics club makers work on very hard and PING got the right combination with this driver. Distance with two different tour ball brands was comparable to other drivers when tested on the course and the G30 particularly seemed to cause the ball to penetrate well into the wind. 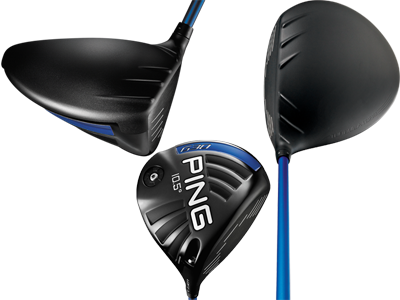 If you are a fan of Bubba, PING clubs and results he gets, take the time to evaluate the G30. I don’t think you will be disappointed.